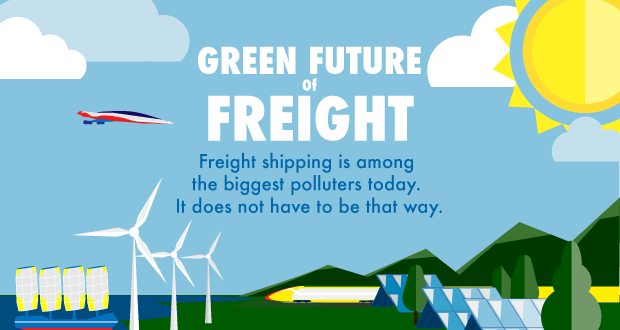 Freightera continues to build the freight transportation marketplace with a mission to transform the whole industry, releases the Green Future of Freight infographic. Vancouver, BC Jan 30, 2017. Freightera, the Expedia-like freight shipping marketplace, continues to work on its mission to transform freight transportation from a large polluter to clean and sustainable industry. Freightera customers will soon be able to choose their freight carriers not just by traditional and mission-critical price and shipping time, but by lower emission option as well. Freightera is making partnerships to feature lower emission carriers and all major North American rail companies in its platform. Rail is currently the least polluting option for long haul freight. The new infographic summarizes current air pollution and greenhouse gas emissions from freight transport, projected growth by 2050, and shows how we can make the transition to low and zero emission transport. It illustrates the article Mr. Beckwitt first authored for the 2016 G7 Summit version of Climate Change: The New Economy (http://touchline.s3-website-eu-west-1.amazonaws.com/g7/climatechange2016/106-1), and following invitation to COP22, the larger presentation at the UN 2016 Climate Change Conference in Marrakech, Morocco. Longer term, solar and wind powered electric rail; wind, solar and hybrid electric cargo ships, and sustainable electric trucks offer the best options for sustainable, zero emission freight transportation. Learn more about our Green Freight commitment.